For years Shift has been making motorcycle gear that is not only safe, but also fashionable on or off the bike. Their Recon pants are the perfect example of something that provides a high degree of safety with a look that won’t leave you embarrassed walking into the grocery store. 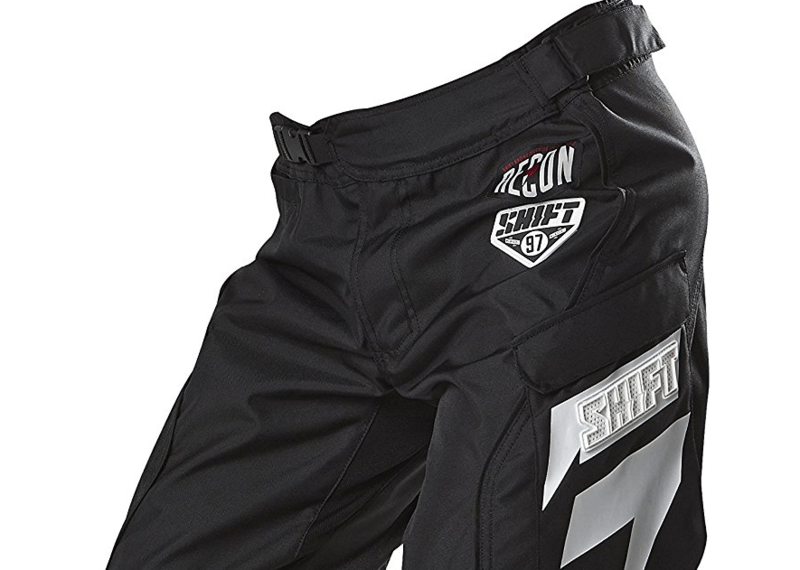 The Shift Recon pants are an interesting design because they combine both leather and textile in their construction. The Recon pants are actually quite snug at the waist, pelvis, thigh area and they tend to flare out a bit near the shins to more of a boot cut. Don’t worry, this doesn’t give you a weird bell bottom appearance. On the contrary I think it gives a really cool ‘urban’ sort of feel to the pants, and one that I don’t mind sporting around the mall or going into a store. The pants unzip up the leg to about mid calf which helps with putting boots on. With other traditional motorcycle pants it is customary to tuck the bottom of the legs into the boot, but with these Shift pants that isn’t really possible. Is this a compromise in safety? Maybe. I’ve worn them and even though they do flare a bit near the bottom I don’t think they would slide up past my boots even in a really bad crash. I do however wear full size motorcycle boots that go up to maybe 5 inches below my knee, so keep that in mind. If you are wearing tennis shoes or some other lower cut boot then this might be a concern for you, so act accordingly. At the waist the pants include a wonderful Velcro belt that cinches and clasps on both sides. This really lets you adjust the pants to your size if you happen to get a pair that is slightly too big. I recently lost a little bit of weight so the ability to adjust the waist was a godsend since I wear these pants so often. When it comes to materials people are pretty divided. Some say that full leather is the only way, while others say that textile is superior. For me they both have their pros and cons, although in general I tend to favor leather. These Recon pants provide the best of both worlds and compromise very little to do so. Because of the leather at key abrasion areas like the hips, knees, thighs, shins etc… you will be protected if you ever go down. Leather is great at keeping your skin on your body, but it can be a little stiff even when it is sufficiently worn in. This is the main reason why Shift made the rest of the pants with a tear resistant material. If I had to put a number on it I would say over 70% of the pants are actually made with leather, but this 30% of textile adds a LOT of mobility for what I would consider a negligible trade off in safety. Some of where this nylon is located is at the inner thigh and crotch area of the pants, a place where I don’t think you will be sliding for too long if you crash. If you do slide on the pavement doing the splits for a long enough time to tear the fabric in that area, then you are either a world class gymnast or someone that has more to worry about than road rash! For impact resistance the Recon’s come with hard armor in the knees. In all the motorcycle crashes I’ve experienced the part of my body that ALWAYS hits is my knees, so I am really glad that Shift included good quality armor in this location. The one thing that I really don’t like about these pants is the buttons above the zip fly. They include 2 snap buttons as well as a piece of Velcro. You would think that would be enough to keep the pants closed but I have had all 3 of these un-snap after I got on my bike and started to crouch forward a bit. Granted this was because I had velcroed the pants a little too tight, after some minor adjustment it was no longer an issue. The only reason I mention it is because this is literally the only flaw I can find about the pants. I recently reviewed some Dainese pants a few weeks ago and they include an ingenious clasp system that looks like it would NEVER fail. I absolutely love these pants. Love love love LOVE them! I wear them walking around the store, I wear them when I go for short rides, or for long rides. They seem to stay relatively cool in warmer weather, and warm enough in colder weather. They look mostly like normal pants, but are just different enough to let people know you ride a bike (which we all know gives you at least 10 cool points!). I think for the majority of riders out there these would be a great pair of first pants. You don’t look like a ricky racer or power ranger wearing them, they have tons of leather and hard armor for protection, and as far as gear goes they aren’t too expensive.